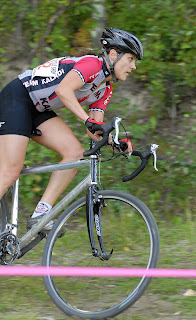 The 3rd race of the 2007 Bicycle Shop Cyclocross series was held at Wednesday evening at APU. Following a day of rain, drizzle and high winds we were blessed with great ‘cross conditions – a bit wet, but not a slog, and another great course by Bruce Ross. Esses in the puddles - what next! In the womens division, Amber Stull once again proved too strong for the rest of the field and won with a 4 minute advantage over second place Nylene Wicks. Josh Yeaton (Kaladi-Subway) regained his top podium position with a 13 second win over Carey Grumelot (The Bicycle Shop). All the competitors are looking forward to he next race of the series, which will be held at a new venue, the Cartee Complex (across from Russian Jack Park), this coming Saturday, September 22. Thanks Jeff,Bruce and others for a cool event. Looking foward to Sat. I added a link to your photos, on the right under "2007 Race Photos". Thanks for the great pics! Rose, the ArcticCross staff apologize for omitting you from the results. We will get the results updated soon. As a small consolation, the next race fee will be waived for you. We hope to see you next time. As far as the link, it seems to be working, please try again.